As the U.S. and Others Toss Syria's Envoys, Is Moscow Changing Its Mind About Assad? 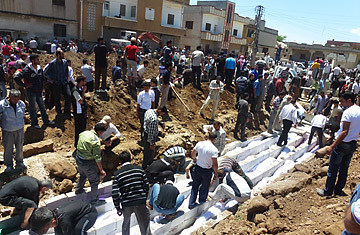 Will Houla Massacre Force Action in Syria? Kofi Annan, the international envoy to Syria, met Syrian President Bashar Assad in Damascus on Tuesday, May 29, in a bid to salvage Annan's battered plan for peace. "He conveyed in frank terms his view to President Assad that the six-point plan cannot succeed without bold steps to stop the violence and release detainees, and stressed the importance of full implementation of the plan," Annan's office said in a statement. For his part, Assad "affirmed to Annan that the success of his plan depends on stopping weapon smuggling and curbing terrorism and those who support it," the state's SANA news agency said. It is not the first time Annan has been in Damascus to push his six-point plan. And it's not the first time Assad has said that he's implementing it. But the key to breaking the stalemate, some observers say, isn't in Damascus but in Moscow. Russia has steadfastly provided political cover for its key Middle Eastern ally, shielding Damascus from diplomatic censure by twice wielding its veto in the U.N. Security Council. On Tuesday, a host of Western nations, including the U.S., Britain, France, Australia and Italy, tossed Syrian diplomats out of their capitals. But Moscow has routinely ignored the growing international outcry. It has continued to ship arms to a regime intent on pursuing what Assad has called a "security solution" to the 15-month crisis, even while it insists that inter-Syrian dialogue, not violence, is the only hope for the troubled country. Some observers say the Houla massacre over the weekend, which left more than a hundred Syrians dead, including at least 32 children, may have prompted a shift in Russia's stance. Indeed, Moscow signed on to a U.N. press statement that condemned the Syrian government's role in the slaughter. Moscow had been expected to block it. The statement condemned the "outrageous use of force against the civilian population," saying it constituted a violation of international law and of the Syrian government's commitment to cease violence. "The members of the Security Council demanded that the government of Syria immediately cease the use of heavy weapons in population centers and immediately pull back its troops and its heavy weapons from in and around population centers and return them to their barracks." Still, on Monday, Russian Foreign Minister Sergei Lavrov was a little more ambiguous. While "the [Syrian] government bears the main responsibility for what is going on," he said, both sides were responsible for the Houla massacre. Moscow does not "support the Syrian government," but rather the "Annan plan that addresses both the Syrian government and the armed opposition," Lavrov said, adding that to avoid another Houla, "foreign parties" should stop "making efforts at regime change." So Russia doesn't support the Syrian government, yet it doesn't want regime change but rather the implementation of a plan that effectively demands that Assad dismantle his own regime. Is that a shift in its policy? No, says Professor Joshua Landis, a Syria expert at the University of Oklahoma who edits the blog Syria Comment. "Russia has a long history of saying that they're not stuck on Assad, they're critical of the regime, they don't like the killing, that this has to be done in a peaceful way, a peaceful transition of power," Landis says. "But under it all what they're saying is they want to see a credible opposition that can take power peacefully before they're willing to change their policy." Salman Shaikh, director of the Brookings Doha Center, also doesn't think Russia has budged, and says the U.N. press statement was "the lowest common denominator for what may be one of the most gruesome massacres." "I think the Russians are quite confused," Shaikh says. "Certainly they've been trying to think out loud how to move this forward and how to support Annan, but at the same time, their actions aren't leading up to that." He agrees that Moscow isn't willing to sign on to a post-Assad Syria just yet because it's "extremely hesitant about what comes next, and not really willing to engage in that, and yet the longer this goes on, we're going to have a much messier transition in any case, which is not in anyone's interest." There have been a flurry of reports suggesting that a Yemen-style transition may be in the offing  and that is where Russia's help will be critical, that is, in persuading Assad to leave office. The supposed deal is modeled on the one that eventually coaxed Yemen's Ali Abdullah Saleh to relinquish power and leave the country. It effectively means decapitating the regime but leaving most of the rest of it intact. Presumably, Russia's interest is that the regime remnants will ensure that its commercial deals and naval base in Tartus along the eastern Mediterranean will remain. It's all unlikely for many reasons, analysts say, not least because Assad has to agree to leave. "It's pie in the sky," Landis says. "Bashar is young [at 46; Saleh is 69], and the Alawites are determined they're going to win." Also, the regime "cannot be reformed," he says. "If Bashar steps aside and the Assad family leaves Syria, the entire thing will fall apart. It is a cult of personality and cult of leadership." Shaikh says there's little appetite for a transition that may take months or even years, given the "level of brutality of the regime." Apart from that, Shaikh says Assad has spilled too much blood for anyone in the Syrian opposition to be able to stomach  or sell to other Syrians  the idea for the President to be permitted leave the country and enjoy a quiet exile. "The time has passed for a Yemen-style solution," Shaikh says. "Who is going to trust this regime, even if you decapitate it? There needs to be a level of regime involvement in some continuity, but it has to be on terms which are dramatically different from perhaps what is being proposed right now." Michael Young, opinion editor of Beirut's Daily Star newspaper, doesn't think Russia is interested in undermining Assad by pursuing a Yemen-style solution. "They keep saying they're not necessarily wedded to the idea of keeping Bashar in power, but in reality ... they have to keep him in power, because if he begins weakening, then their leverage obviously weakens, and once that happens, their ability to negotiate a transition in Syria weakens, and yet the paradox is that precisely because they have that leverage, they don't want to lose it by negotiating a transition in Syria. In a way, they're a prisoner of this situation." The International Crisis Group's Peter Harling sees Russia less as a prisoner and more like a prima donna, enjoying the political dividends of its starring role in the Syria story. "They hit the bonanza," he says. "Their position on Syria has provided them with important political dividends. People think it's like the Cold War all over again  powerful Russia standing up to the U.S., projecting itself internationally, and with military assets in the Mediterranean. It's all very superficial, it's a big bluff, but like any bluff, they want it to last as long as possible." That role is sustained by the Annan mission, Harling says, and if the mission were to collapse entirely, so would Russia's interpretation of its starring role. "I don't think Russia would stand by this regime indefinitely and be an ally in the context of a civil war, for instance," he says. "I think they have an interest in seeing this mission survive, although they don't want it to be hijacked by what they would describe as a reckless Western regime-change agenda either." Shaikh thinks Russia's higher profile, particularly in the Middle East, is not something to crow about, because it's being viewed "in negative terms." It should be mindful of its wider interests in the region, he says, particularly its ties to Gulf powerhouses Saudi Arabia and Qatar, which vehemently oppose Assad. Harling disagrees. "They've lost so much in this part of the world that they're free, there's nothing to lose," he says. For his part, Landis says Russia's Syria policy dovetails with its regional interests. "Russia's wider interests, to me, are pushing back at the Americans, preserving Iran and Syria outside of U.S control and showing their friends that they can stand by them," he says. Ultimately, Russia's political cover may help the Syrian regime stay in power for a little longer, but that may be all, given the fact that it has alienated wide swaths of its population. "I'm not sure this regime can survive," Harling says, "with or without Russian support."